When we think about work apparel with quality, Williamson-Dickie Manufacturing Company – popularly known as Dickies will always be one of the many popular brands that will come 1st into our minds. It was in 1922 when this small bib overall company started then later on ventured into more work apparel that many workers enjoyed wearing. Though the years of making and supplying quality and durable products, Dickies have expanded and invaded different countries already bringing the brand to Australia, Russia, South Africa, Canada, Chile, Japan, Iceland, Europe, Mexico and Philippines. Today, you’ll not only find Dickies brand manufacturing and selling industrial work uniforms like work pants, work shirts, steel-toe boots, shoes but they already have myriad of items such as such as bags, belts, denim jeans, hats, coverall, jackets, medical scrubs just to name a few. If you think that Dickies is only for men, think again. They also have wide range of products for women and the includes cargo pants for women, jeans, shorts, skirts and more. Kids and even toddlers can even enjoy the quality products that they have for them. 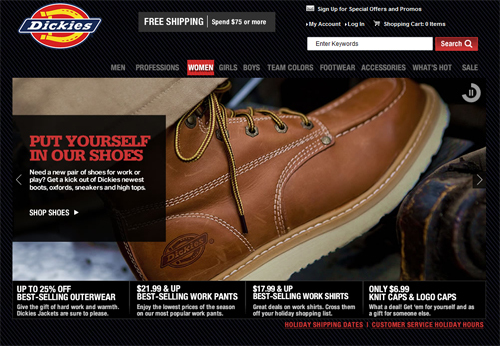 Offering more products to their customers brought Dickies brand closer to more clients all over the world. Check out their clearance sale at their website and who knows, you might snag hoodies, shoes, short, pants etc. that are on sale.